The system will replace the current national (.ee) domain registry for Estonia. Software can be used to run any top level domain registry. The system features EPP and REPP interfaces. This is an open source project: https://github.com/internetee/registry. A Rails 2 project which I took over. Application for managing debtors, customers and their payments. The most significant improvement I did into this system was integration with RIHA, more specifically with KIS. For this, I had to develop handlers to connect with Estonian X-Tee and then satisfy the SOAP format requirements set by KIS. I also had to install security server which is required by RIA and is responsible for encrypting the communication between servers. 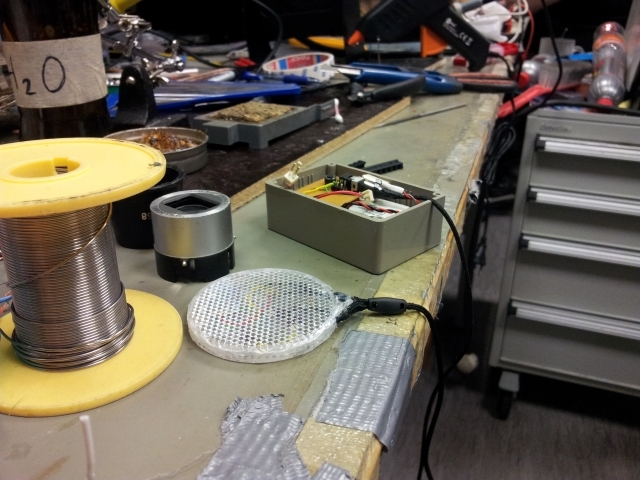 This is almost fully tested project. Rails 4 application for generating reports from multiple databases. The interface includes dynamic SQL window so every query can be customized. Every report can be exported to CSV format. Friendly Finance Ltd offers financial services in Europe. Released for Kaubamaja Group internal use. I wrote SQL procedures and Java classes (and UI) capable of generating hundreds of thousands of unique gift cards into the Oracle database, exporting them into txt files and encrypting them with SK authentication certificates so that the generated cdoc file could be decrypted by only the people whose identity codes were provided in the gift card application form. This can be done by using the private key on the recipients ID card. The whole process takes under a minute. Interface for car services for managing customer data, automatically scheduling jobs, timetable and time tracking for mechanics. Digital signing service for companies and individuals. New version of allkiri.ee (not yet released) consists of backend API (rails-api) and standalone front-end (backbone.js). Test driven project. Back-end system for calculating bonus points on Kaubamaja Group Partnercard. Java classes and XML schemas for loading data files (from cash registers) into the Oracle database, SQL procedures for calculating bonus points each night. Administrative front-end interface for Kaubamaja Group internal use also written in Java. Back-end application for Säästukaart+ to manage credit card applications, contracts, cards, reports, account receivables, etc. 2013 summer we added loan and hire purchase features into the system with a sophisticated payment schedule. The system was designed for ETK Finance internal use. Back-end Consumer Financing Service. Applications, offers, contracts, payments, reports, customer management. 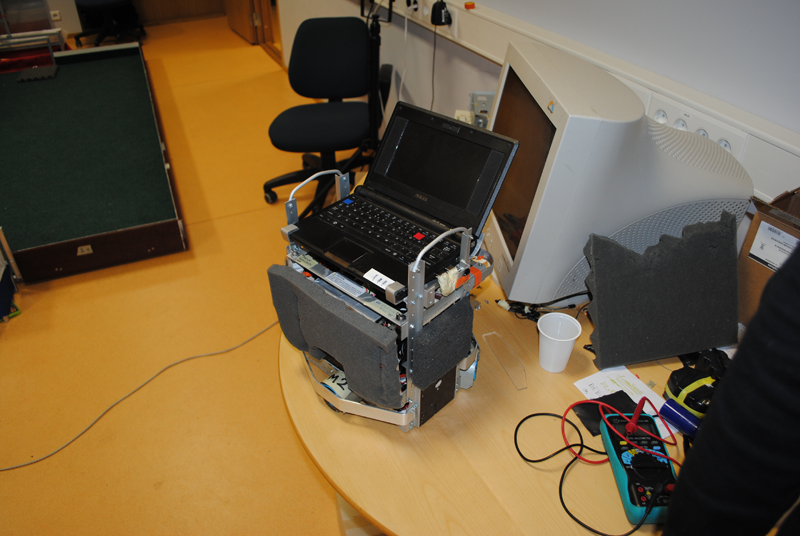 The object of the project was to create an eye controllable feeding robot for the disabled. Code name of the project is R(eye)bot which is Rebot, in short. Processing platform was chosen along with the infra red camera. After installing the operating system and necessary drivers, complex software was developed to control the robotic arm via the headset. The code was written in Python and Bash and was released under MIT licence in Github: https://github.com/mlensment/rebot. Video from the prototype was published in Youtube: https://youtu.be/gn2T4rIBAUM. For further development, the code provides a good platform to easily add more servos and extend the user interface on the headset. This script will play music, when your dogs starts barking loudly. For further comfort, you can easily stop or start music with your mobile device. This is extra handy at night when the computer is too far and your phone is close. What's interesting about this project is the fact, that it consists of only one file. This file includes amplitude sampling from microphone, audio playback and running a web server (for the GUI). The script is developed using asynchronous methods (mainly sub shells) and is non blocking. Postgre database backup tool. Places backups on the local disk and also to Amazon S3 cloud. A project to make an ordinary reflector more fun. It consists of ATiny85 chip, temperature sensor, battery, LEDs, button and some other tiny components like capacitors, diodes, resistors. Reflector has 9 different programs. The most fancy one reads temperature and lights LEDs accordingly. When it's colder it glows blue and when its warmer it glows red. Other programs flash LEDs in different manners. A game. The object is to guide a line through a maze. Each level gets faster and trickier. Click on the link above to try it out! A game prototype for mobile browsers. The object of the game is to move the ball by tilting the mobile and avoiding randomly generated walls. It can be slow on older devices and velocity vector calculation still need some improvements. Game proto may be found here. This may only work on mobile devices or this may not work at all. Tested with Android 2.3.3 Firefox browser and Android 4.1.2, also on Firefox. X and Y axis were inverted on Android 4 for some reason. Another presentation of the ball movement is here. 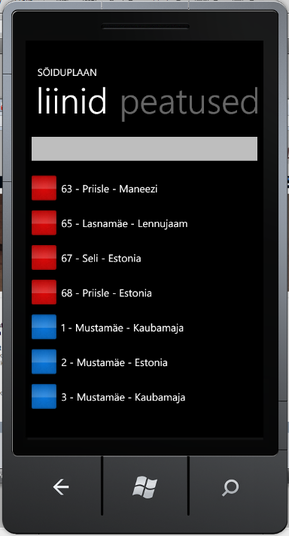 Public transport app for WP7 platform. Done as a group of 3 people. Unfortunately it never went live because our time and resources were limited. A football robot for Robotex 2010. Built on top of Botmaster platform (provided by the IT College). It consists of Qt and OpenCV libraries. Some footage from the competition: [www] We came fourth. A simple game. The object of the game is to guide the hedgehog and reach as high as possible.